The 40 MW Spion Kop wind project in Montana, developed by Compass Energies for NorthWestern Energy, came with an interesting challenge: how close should the wind turbines be to nearby missile silos? 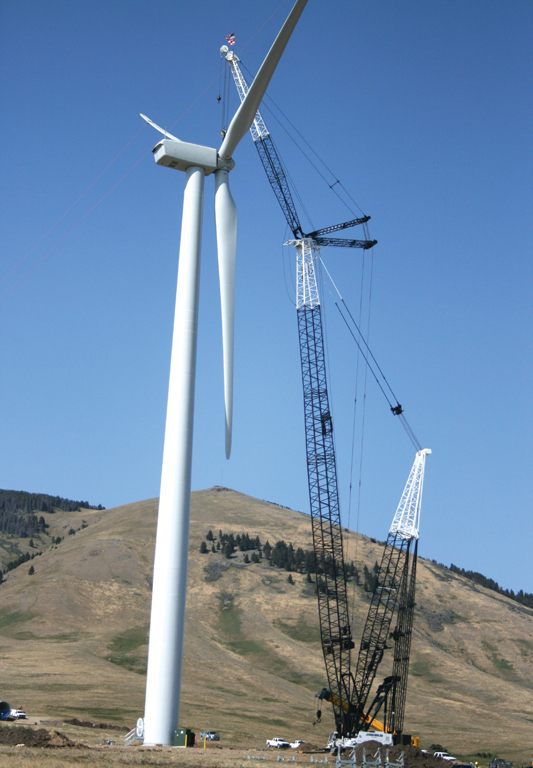 Every wind power project has its construction challenges, but the 40 MW Spion Kop wind project built in Montana by Compass Energies had a bit of a unique situation: where should they locate their wind turbines in relation to nearby missile silos? 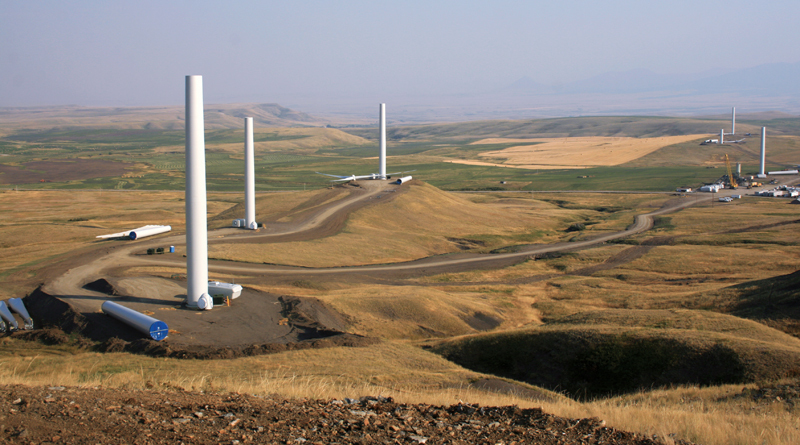 The Spion Kop wind project was built in the north central Montana region where the Malmstrom Air Force Base is located—home of the 341st Missile Wing of the Air Force Global Strike Command. Malmstrom AFB also happens to be one of three U.S. Air Force Bases that maintain and operate the Minuteman III intercontinental ballistic missile. "That was certainly something newer for some of the Department of Defense (DOD) people," said Kyle Paulson, director of project development for Denver-based Compass Energies. "The siting of the project near one of the missile silos prompted the DOD to determine what their comfort level is on siting and setbacks." The siting regulatory review was brief, however, and the DOD came back requesting a 2,500 foot setback. "That size of setback was really not a factor for us—our nearest turbine was well over a mile away." In general, the company kept the Base in the loop with their construction plans. "We went through the whole construction schedule with the Base because of the silos, and we also needed to make sure what we were doing did not impact their communication lines, which are buried around the site. It was a very collaborative effort—we worked closely with them." 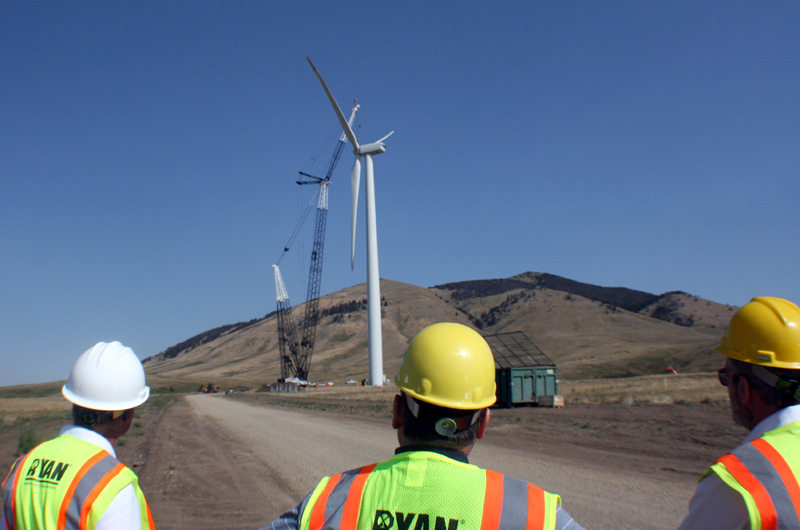 The Spion Kop project, about 50 miles southeast of Great Falls, Montana, marked the first wind project for Compass Energies, whose management team is made up of a collection of wind industry veterans. Paulson and company vice president Ilan Caplan, for example, are both veterans of Clipper Windpower and other energy companies. The company started work in Montana back in 2009. "In preparation for some RFPs and developing our presence in Montana, we had located a number of sites that we thought had good transmission and wind resources," said Caplan. The company had a meteorologist on staff whose specialty was complex terrain, which fit the focus of Compass Energies on the western United States. "He was able to pinpoint this and other sites within Montana for us to look at. Even though there had been quite a bit of land already taken in the state by other developers, we were able to obtain the Spion Kop site in response to an RFP that was coming out from NorthWestern Energy." The name Spion Kop, incidentally, comes from an old wagon train town in the area that was bypassed when the railway was built in the 1880s. NorthWestern Energy is one of the largest utilities in the northwestern U.S., with 656,000 customers in Montana, South Dakota, and Nebraska. The wind project site itself is rolling hills in the foothills of Montana's Highwood Mountain chain, and it lies between the Highwood Mountains to the north and the Little Belt Mountains to the south. The land is primarily used for grazing cattle, with a limited amount of acreage in alfalfa. The site definitely has its vertical ups and downs, and that offered some construction challenges. The elevation for the turbine sites varies from 4700 to 5200 feet. "The ridges are spaced so you can add a few rows of turbines in there, spacing them well," said Caplan. The wind resource is described as "robust" on the 4,000 acre site. In this area of Montana, there is a lateral acceleration of wind in the mountain topography, resulting in a very good wind resource. Due to the military base in the area, Compass Energies had a good secondary road to work with. "They need access to the missile silos in the winter, so the road is well maintained." From a logistics standpoint, the 25 GE 1.6 MW turbines and associated materials used on the project travelled through the nearby town of Geyser. Spion Kop had a number of weather days, but during those days, they worked on ground-related aspects of the project. "We would also try to shift the timing on when people would start during the day, so if we knew a weather event was coming, we could get things done before it arrived." Even though they faced a big deadline, with the then-pending expiry of the PTC, the company managed the project carefully, keeping its scale in mind. "Some things happened in series, some things happened in parallel on the project. We tried to avoid stacking too many people on the project at any one time," says Caplan. "You can only condense the schedule so much and have only so many people on site doing multiple things at once." Due to its location near the Highwood Mountains, there were some environmental considerations with the site and the project. In the winter, big game animals (primarily elk) use the area, some of which is in the critical wind range. One of the unique project initiatives Compass Energies pursued involved working with Montana Fish Wildlife and Parks to come up with a rest rotation grazing plan for a certain portion of the project, to enhance the amount of grass available to game that come down from the mountains during winter. "We also carved out a specific maintenance plan for the purposes of avoiding and minimizing adverse impacts to big game grazing in the winter. Routine maintenance in certain portions of the project area is conducted outside of the winter season, while immediate maintenance in those portions of the project area is timed for mid-day whenever big game animals are observed in the morning." There are also eagle nests in the general region. Over the course of several years, Compass Energies did multiple aerial surveys and tracking of eagle activities, employing an eagle expert from Montana State University. "That helped us and our customer, NorthWestern Energy, get comfortable with what exposure the project would have to eagle use," said Paulson. "There are going to be floaters and occasional migrants through the project area, but it seemed like those nesters were not travelling as far as the project area very frequently—if at all." Part of the goal of work such as this is identifying any issues upfront, so mitigation efforts can be made. "The goal of Compass as a project developer is to present projects that have low risk," explains Caplan. "The true way to avoid many issues revolves around the upfront work and choosing a site that—as much as possible, since you don't have the full scope of information—limits potential risks." The only change required to the Spion Kop project was a small adjustment to turbine layout to accommodate a raptor nest in the area. "Overall, the original selection of the site was solid in terms of the land use and wildlife use. It was just a matter of tweaking." Compass Energies did a fair amount of on site meteorology work with reference stations and developed a long term forecast; the conclusions were reinforced by an outside party. "NorthWestern engaged DNV Renewables as their independent engineers and representative, and their analysis and long term expectations came out almost identical to ours," said Caplan. DNV Renewables (USA) Inc. represented NorthWestern during the site selection, construction, and through to closing. Compass Energies faced a couple of very rigid time deadlines with Spion Kop. As mentioned previously, at the time there was the looming expiration of the Production Tax Credit. Added to this, there was also a mandatory 270-day Montana Public Service Commission (MPSC) approval period before a Notice to Proceed (NTP) could be issued by NorthWestern. "Those were two very big factors that we were dealing with," said Caplan. To keep the project moving ahead, and to meet the PTC deadline, Compass had to take some calculated risks. 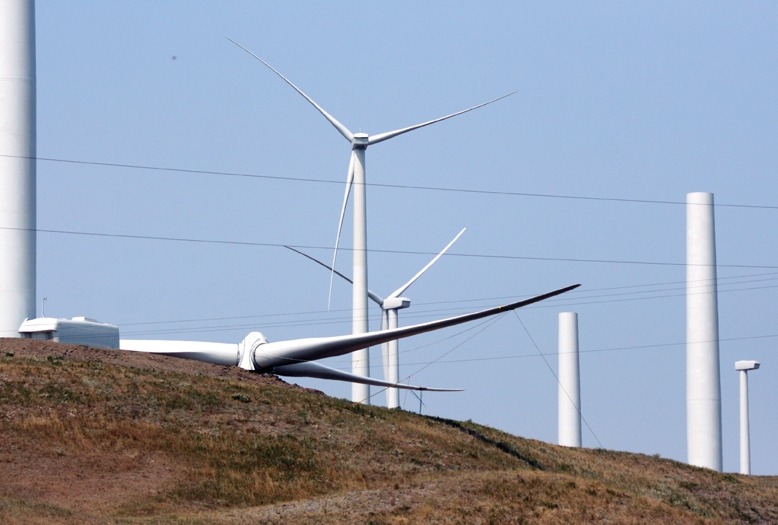 The Spion Kop wind project was built in north-central Montana, where the Malmstrom Air Force Base is located. Malmstrom AFB happens to be one of three U.S. Air Force Bases that maintain and operate the Minuteman III intercontinental ballistic missile. "We knew that the MPSC could take the full nine months to come up with a determination," said Caplan. "So ultimately we had to commit to contractors, equipment, and deliveries as well as negotiate the turbine purchase, all prior to submission and the NTP." There was a possibility that on the last day of the ninth month, the MPSC could reject the project. "We had to go at risk with a number of things to GE and the Balance of Plant contractor, in order to support the schedule." In more normal times, they would wait to get the approvals before proceeding with such supplier commitments. The MPSC approval came on February 16, 2012—but it came with conditions. NorthWestern Energy, however, acted quickly, reviewed the conditions, and agreed to them. Then the project really went into high gear. "That was the big driver. Once we got that, we moved as fast as we could with getting the project completed before the end of the year, to meet the PTC." Then they had to work around the sometimes punishing Montana winter weather. "We were focused on the spring thaw," explained Caplan. "With the snow and the melt and the rain, we couldn't actually get going until the early spring. And we also had to contend with competing deliveries for equipment because there was a rush to get things done before the expiry of the PTC. The PTC was eventually extended, but it sure did not look like that was going to happen at the time." There were a lot of wind projects under construction, a lot of them much bigger than their 40 MW project, and these projects were taking up resources, everything from turbines to cranes. "We relied heavily on GE—we keyed everything around turbine deliveries. Everything else had to be in line based on the turbines. We needed the turbines to come at the right time, and it worked out pretty well." Ryan Companies US Inc. and Carstensen Energy Inc. served as the BOP contractor. The two companies have a joint venture relationship, with Ryan taking the lead. As noted there were some weather days on the project, but they tried to plan for those, as much as possible. "We tried to prep for the weather that could happen by not only looking at the standard weather models, but we also used our in-house meteorologist on a daily basis—he could localize the weather forecast better than most resources." Combined, they had some very good forecasting and were better able to determine the weather windows that lay ahead. This high attention to detail paid off, and the project came in on time and on budget, so NorthWestern Energy, the eventual owner of Spion Kop, indicated to Compass that it was happy with the end result. Compass was able to negotiate a full-service agreement with GE on the 25 turbines. "It was one of the first full-service agreements signed within the GE fleet," says Caplan. "It was heavily negotiated, and it came out positive for both parties. And it will be a benefit for NorthWestern too, since this is their first owned project—and they have high performance goals for it." The Spion Kop wind project sits in rolling hills in the foothills of Montana's Highwood Mountain chain, between the Highwood Mountains to the north and the Little Belt Mountains to the south. A year on, the wind project has been performing well above expectations, so much so that during the winter, they had several days where the efficiency rate was over 90 percent. In the end, Caplan says, there was a feeling of achievement with the Spion Kop project. "No construction project happens without issues, and it's really how you deal with them. And we were able to work through all the issues. We're happy with how things came together." Just as importantly, the Spion Kop project's owner has communicated to Compass that it is satisfied. "NorthWestern were understandably anxious sometimes, but they were great partners to work with. We recognized that this was their first wind project—it was not a case of 'thanks for the approval, we'll see you in nine months.' We brought them along for the process, including turbine selection, working on site with their independent engineer, and we worked directly with them, incorporating their people and as much communication and approval as was possible. "NorthWestern was the ultimate owner, and we wanted them to feel comfortable with the asset they were purchasing and make them a part of the decision-making process," says Captain. An example of the collaboration is that, early on, NorthWestern said they would build transmission lines and interconnection facilities. "So they took on that piece of the project and built the line down to the interconnection point. It made sense—they could build that part of the project to their standard specs and manage a process that they do well, with the contractors that they work with. There was a good division of responsibility based on each company's skillsets." With the Spion Kop project complete, Compass Energies is now focusing on developing other wind projects in the western U.S. It has about 1,000 MW of projects in the pipeline. Though it is small, Caplan says the company is able to draw upon a broad range of experience in its management ranks. Company founder Chris McCall was a project finance banker at Fortis Bank, focusing on energy financings. Caplan and Kyle Paulson came from the OEM and development side of the business, while their counsel, Brad Haight, has experience working with landowners and developers. Between them, the group has been involved with over one gigawatt of wind projects. "As a smaller shop going from beginning to end, we are able to address all sides of a project. The benefit of having that wide array of experience is that when we look to design and develop a project, we are looking at the end game. We've seen how wind projects go and where they need to end up. At the end of the day, these projects need to be financed and owned by someone. "I'd compare it to building a home. Depending on what you are doing, flipping it or living in it, it turns out differently. Our view is we build our projects, like homes to live in, for the long term."